The course materials consist of 45 pages of lightly edited transcripts accompanied by five video excerpts of Lama Zopa Rinpoche’s teachings drawn from the Light of the Path Retreat 2009 held in North Carolina, USA. The commentary to The Method to Transform a Suffering Life into Happiness is compiled from various teachings given between 2009 and 2015. 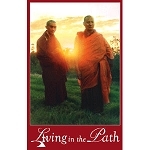 The commentaries to Blessing the Speech and Daily Mantras are mainly extracted from teachings given during the Light of the Path Retreat 2009 held in North Carolina, USA.